After 39 years on the throne, King Juan Carlos I of Spain has informed Mariano Rajoy, the country’s Prime Minister, that he is to step down in favour of his 46 year-old son, Crown Prince Felipe, “for personal reasons”. Once one of the world’s most popular monarchs, Juan Carlos has been plagued recently not only with ill-health, but with a series of personal scandals which has sent his popularity amongst Spaniards, plummeting. An amendment to the Spanish Constitution will now be rushed through parliament to permit the king to abdicate. 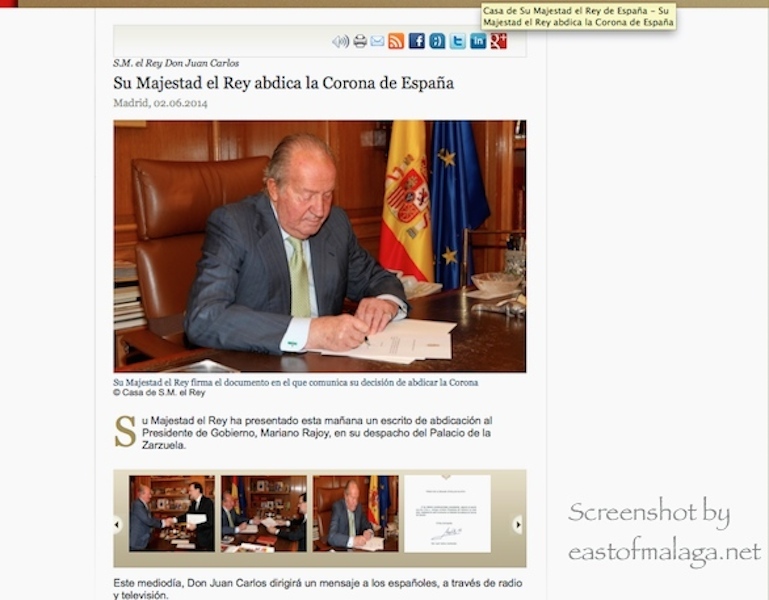 This entry was tagged Europe, King Juan Carlos, life, Monarchy, Royalty, Spain. Bookmark the permalink. Just been watching it from the UK on tve 24h – I think it can only be a good thing. I agree though that he did some good things through the transition period, the latter years let him and the Royal Family down though. Time for new and younger blood. Can you ever imagine our Queen abdicating?! I can’t, think she’ll hang on as long as she can! I think it will be a good thing for Spain – to get things back on track. Fresh start and all that. No, I can’t see that happening in the UK either, Tanya. The King of Spain abdicates. I was listening to the radio this morning when Rajoy made the announcement… it’s going to be nothing but that fuelling the tertulias for the next month or three, and then we’ve still got the coronation to come! I guess we’ll have to wait-and-see how long the process takes. I would imagine the Coronation won’t be until next year. I think they’ll do it soon… to stifle the “should we even continue with this monarchy malarkey” debate as much as possible. You could be right ….. I think the Spanish people will remember most the King’s active role in helping to restore democracy. However the monarchy and his later years are regarded, his leadership in that period was vital for his country. That’s right, Ron, he led the country from dictatorship to democracy – a very important step for Spain. Sadly, many younger people do not remember that, and merely see the corruption, affairs etc of recent years. Pity it had to go that way. Let’s hope Prince Felipe can restore the popularity of the Monarchy and the trust of the People of Spain. If hr must shoot elephants it had better be with a camera. It’s up on the BBC news site now as well. Big news!